It’s been a rough 2018 for David Accam. Coming into last Saturday’s match against Accam’s previous employer, Chicago Fire, Accam had yet to record a goal or an assist in MLS play. His only scoresheet contribution for the blue and gold was a penalty kick goal against the USL’s Richmond Kickers back in June. After his ice cold start to the first nine matches of the season with his new team, Accam was relegated to the bench in the following nine out of ten matches – failing to appear in two of them. Then Saturday happened. Back in Bridgeview, IL for the first time since his transfer to Philadelphia last spring, Accam was subbed in early when Ilsinho went down in the first 20 minutes with an apparent groin strain. And 70 minutes later, when Bastian Schweinsteiger headed in a stoppage time equalizer to level the game at 3-3 and seemingly dash the Union’s hopes for three points on the road, it looked like Accam would again — save a bobbled cross from Chicago keeper Richard Sanchez that hopped into Cory Burke’s lap — fail to make any negotiable impact in the game. But then the ball fell to Accam as the clock inched toward the 96th minute. The referee looked at his watch. Accam looked to goal. He put his head down, took on three defenders, and hit a shot that was surely soul-crushing to the Chicago fans who once sang his name. 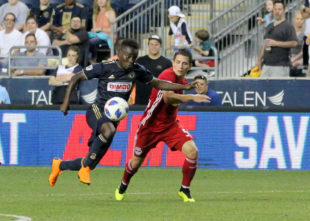 It was the type of play that Union fans had been anticipating since the Accam signing was announced on Draft Day — a flash of brilliance that is over before you know it: Accam on the ball, speeding down the flank, and then… boom… the ball in the net. That pure goal hunger has apparently alluded Accam since joining Philadelphia. Perhaps, ripping off his shirt in pure joy as the ball hit cotton, Accam will rediscover his appetite — and form — for goals.